Three years ago, I became a certified alligator wrestler. Why? Because I thought it would be a conversation starter on my resume. My friends and family were incredulous: “Are you insane?” they asked. Talk to Albert, I replied. Albert Einstein, perhaps the greatest intellect the world ever has known, advised, “The only insanity is doing the same thing over and over again and expecting a different result.” So, whatever alligator you’re wrestling with – getting good grades, getting a good job, making a public speech, making a key putt on the golf course, or making out with that cute guy or girl in chemistry class – the following steps along Frost’s less-traveled path will make all the difference in your life. Not surprisingly, the journey starts with change. It is comfortable not to walk into a pond full of alligators, or not to try anything that is perceived to be risky. 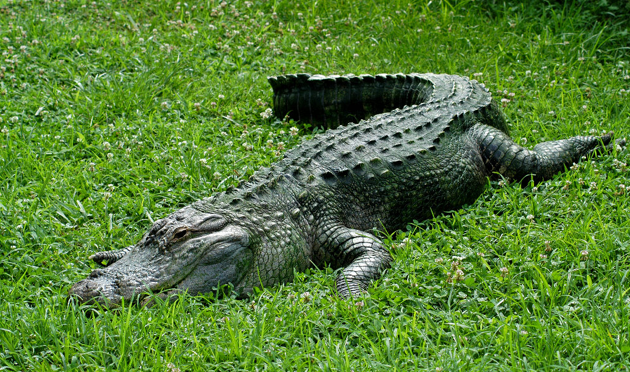 So, why is it so easy to drive a car, statistically way more dangerous than grabbing an alligator’s tail? Because when one gets into a car, the focus is on getting from Point A to Point B; conversely, the focus shifts onto a negative outcome when thinking about wrestling with alligators. 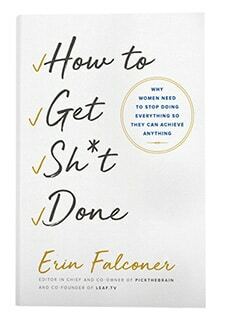 “You must do the things you think you cannot do,” counseled Eleanor Roosevelt…or forever be locked down in the prison of Can’t/Won’t (if you think you can’t do something, you won’t do it). Once you decide to get out of your comfort zone, the only way to take that first step into the alligator pond is by focusing on a positive outcome. Think only about what you want to happen, not about what might go wrong. When you’re thinking about what you want to happen, your focus is on success, and you will “program” yourself for a favorable outcome – and success will be yours. If you think about what might go wrong, you are focused on fear and doubt, and programming yourself to fail – and you will. 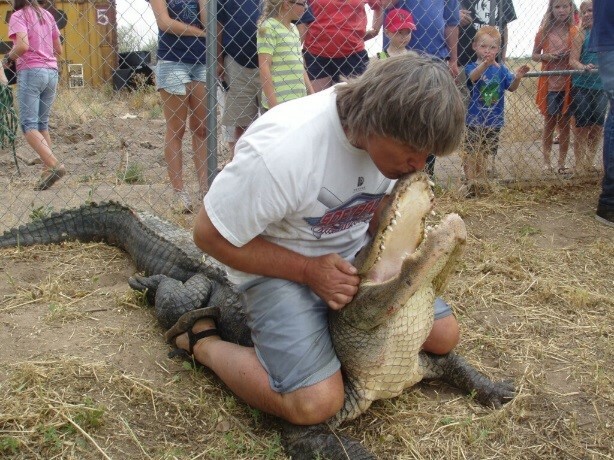 The key to wrestling alligators is grabbing on to their tails and not letting go. They will try to pivot around and bite you, but they cannot pivot all the way around, and their muscles (except for their jaws) are not very strong; so, if you hold on, and move in the opposite direction of their pivot, there’s no way they can get bite you. Eventually, they will get tired and give up, and you can pull them out of the pond, shove their tails between your legs, jump onto their backs and pull their necks back – and you will have won the match. Whatever alligator you’re wrestling with, do not let go of the tail, no matter what. In other words, stay focused on your positive outcome and do not get distracted by whatever might bite you in the process. Edmund Burke wrote, “He that wrestles with us strengthens our nerves and sharpens our skill. Our antagonist is our helper.” After wrestling seven alligators and walking out of that pond with all my fingers and toes intact, I had an immediate feeling of invincibility – I was happy, relaxed, and supremely confident. And I tucked that invincibility card away for the next time I waded into a pit of alligators, literal or figurative. That’s a card you’ll always have and be able to play – and it will trump all negativity you might encounter on the way to getting what you want or getting to where you want to be. Success does breed success – indeed, each successful outcome is a stepping stone to greater and greater heights. Speaking of heights, your friend, the alligator, will help you to the top of the mountain. By the time you get to the top, you will have proven to yourself that you can do anything and that everything is possible. Oddly enough, this is when you will be most vulnerable – because you have been taught that human beings cannot fly and, most likely, you have chosen, uncritically, to believe it. Thus, you will be tempted to think that you can go no further, that the next step has to be down. Is it as insane to think that your next step must be up as it is to walk into a pond full of alligators? It sure is, unless you change something. If you choose to change your mind and change your focus? That’s when you’ll learn to fly! At the end of the day, I kissed my friend, the alligator – no tongue, though.